Creamy, fleshy and naturally sweet, these luscious dates are the ultimate fruit experience. Queen of all dates, this royal fruit was once an essential part of all royal feasts. This excellent source of fibre, potassium and antioxidants are simply irresistible for the body and the taste buds. With its flavour somewhere in between caramel and maple syrup, Medjool dates can be considered nature’s candy as they satisfy even the most stubborn sweet tooth. This fruit will revitalize your system as its nutrients are quickly assimilated by the body. Medjool dates are the definition of decadence without the guilt! This product traveled 4552 km to reach our warehouse. PRANA is for the foodies of the world as much as it is for cooks, active individuals, families, people on-the-go or the person trying to achieve health through nutrition. Basically, anyone who loves food and the ability they have to give their well-being a boost with nutritious and flavourful foods. 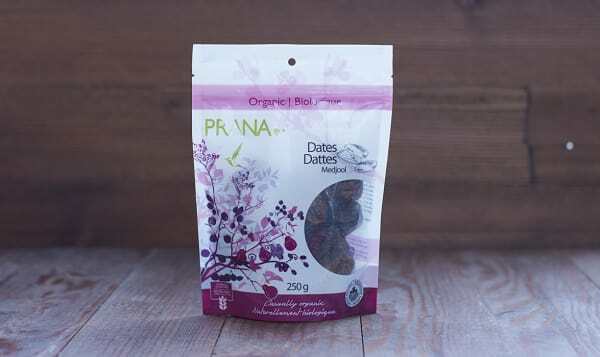 Prana creates organic & vegan (no animal by-products) foods with the environment and their customer’s health in mind 100% of the time. Prana strongly believes that organic agricultural practices are some of the best ways to preserve our planet’s integrity as well as our own. By choosing to buy organic, you are helping to preserve biodiversity by respecting Mother Nature and encouraging everyone to make a difference in their home, their community and on a global level as well.